Originally penny rugs were made from scraps of dark wool fabric or felt from used clothes and hats and were used as mats to clear mud and dirt off shoes. 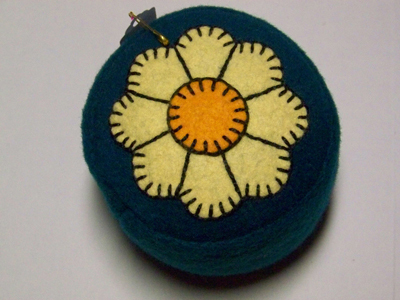 They were named penny rugs as they were made of three different sized circular medallions layered on top of each other. The top medallion was the size of a penny, though in the 1800’s pennies were larger than they are now. Sometimes pennies were actually sewn into them to help weight them down and make them lay flat. They were backed with burlap, heavy canvas, or recycled pants’ materials. When a circle of wool on the rug wore out, it was replaced with another circle. 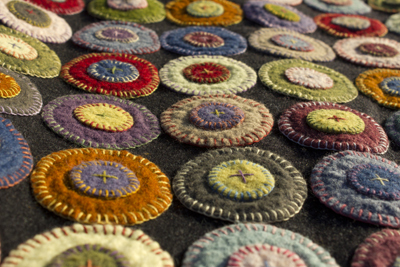 These rugs were embellished with colorful wool yarns that were hand dyed using vegetable dyes. 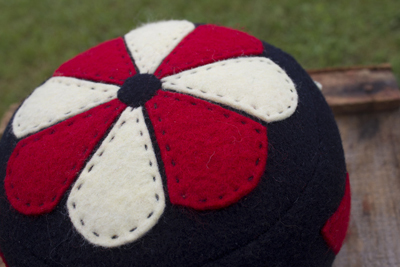 Blanket stitches were sewn around each circular medallion, which added strength and durability, making them quite functional. Penny rugs were strong enough to withstand being beaten with a rug beater to remove mud and dirt. Washing them was done infrequently, by hand in a tub, usually outside and then hung out to dry in the shade to prevent sun fading. 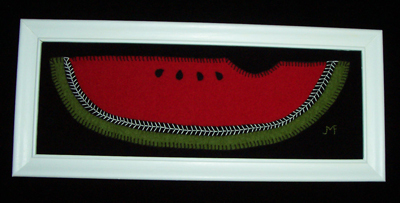 Eventually penny rugs evolved into a traditional and colorful folk art. Women used their remnants and scraps of wool from making clothes, or “turned” wool from used clothes to make their penny rugs. They would use bits of material too small to be used for strips for hooked rugs. Designs evolved from the simple circular medallions into colorful works of art with primitive appliquéd patterns of various animals, stars, hearts, flowers and other shapes. Personal and elaborate stories were communicated through them using designs that included people, their homes, various scenes and landscapes, thus transforming their scraps into wonderful works of art and story with elaborate stitching. Decorative edging also became part of the art. 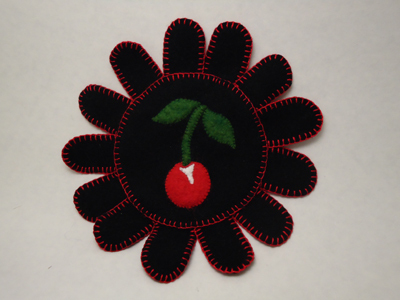 Scalloped edges or tabs cut in the shape of teardrops or tongues were added and many of these were decorated with appliquéd circles of wool using colorful blanket stitching. Penny rugs have recently made a “comeback” and are used to cover beds for warmth and decoration; or to decorate table and mantel tops; decorative and colorful pillows; wall hangings or pictures or throws for the backs of sofas. Variations of penny rug art have moved into quilt making as well, and almost every quilt show will have at least one wool penny rug style sampler. 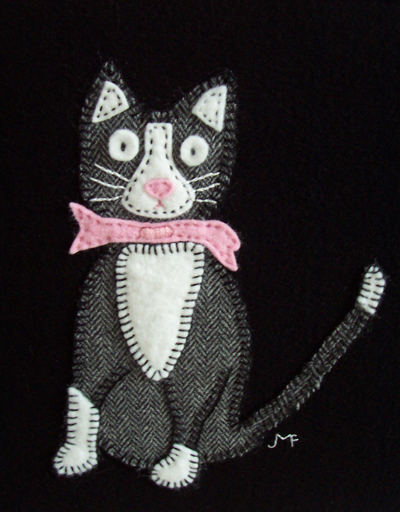 They are both a delight to see as well as to create and sew! Your penny rugs are beautiful, and I love your history lesson on them (that's what I was searching). LOVE the cherry one! I am a cherry collector,..dishes, etc. Very nice felt items! I've recently started making penny rugs and wanted to find out a little about their history, which is how I discovered your blog. Thanks for sharing your knowledge, your blog is a great find–I'll definitely be back. One thing you didn't mention though–making penny rugs is totally additive! Jane, nice compilation of notes about the history of penny rugs. Thanks for the link back to my website. I share lots more on my blog. I am from the south.Raised by a southern grandmother who passed on this beautiful history lesson &story of penny rugs, which i also make. Her large southern home inherited to her by elimination of family. Passed on to her was the tale of the returning soldiers of the end of civil war and since her home was used as headquarters for the yankees, it was saved and not burned to the ground as others were. To this day on many of the old furniture were some of the original and old penny rugs used as candle mats. They usually were near a window. Burning Candles were placed to tell a soldier, be they yankees or rebels that help was there. Most the soldiers had dysentary, consumption or just starvation. My great great grandmother put the hate aside and turned to help these men, including burying them if needed. She would take a piece of their uniforms and make the penny size needed for these rugs.She and what slaves stayed rescued and fed any stranger who wandered near the glowing light in the windows. At night, the ladies made the penny rugs by candlelight.Like i said some are still on display, faded to neither blue nor grey. I'm a great grandmother now, but my memory of these lovely treasures will always be in my mind and passing it on to you. i would absolutely love to see pictures of those pennies. How wonderful for you to have such treasures.